خاشعی سیوکی, عباس, سربازی, محبوبه. (1394). بررسی توزیع مکانی کیفیت آب زیرزمینی با استفاده از مدل‌های MLP ، LS-SVM و زمین آماری. مجله آب و فاضلاب, 26(3), 93-103. عباس خاشعی سیوکی; محبوبه سربازی. "بررسی توزیع مکانی کیفیت آب زیرزمینی با استفاده از مدل‌های MLP ، LS-SVM و زمین آماری". مجله آب و فاضلاب, 26, 3, 1394, 93-103. خاشعی سیوکی, عباس, سربازی, محبوبه. (1394). 'بررسی توزیع مکانی کیفیت آب زیرزمینی با استفاده از مدل‌های MLP ، LS-SVM و زمین آماری', مجله آب و فاضلاب, 26(3), pp. 93-103. خاشعی سیوکی, عباس, سربازی, محبوبه. بررسی توزیع مکانی کیفیت آب زیرزمینی با استفاده از مدل‌های MLP ، LS-SVM و زمین آماری. مجله آب و فاضلاب, 1394; 26(3): 93-103. کنترل کیفیت آب زیرزمینی به‌علت کمبود آب در مناطق خشک و نیمه‌خشک از اهمیت ویژه‌ای برخوردار است. مدل‌های زمین آماری، روش‌های توسعه‌ یافته پهنه‌بندی برای پیش‌بینی مکانی ومیانیابی پارامترهای آب زیرزمینی محسوب می‌شود. در این پژوهش روش‌های IDW، کریجینگ و کوکریجینگ در زمین آمار با مدل‌های پرسپترون چند لایه و مدل حداقل مربعات ماشین ‌بردار پشتیبان برای پیش‌بینی توزیع مکانی پارامتر EC آب زیرزمینی بررسی و با یکدیگر مقایسه شد. داده‌ها از 120 چاه در دشت مشهد جمع‌آوری شد. بعد از نرمال‌کردن داده‌ها به‌منظور استفاده در مدل‌های زمین آماری، واریوگرام‌ها ترسیم و برای انتخاب مدل مناسب، کمترین RSS استفاده شد. سپس با استفاده از اعتبارسنجی متقابل و معیار RMSE، بهترین مدل درونیابی انتخاب شد. برای مقایسه سه مدل از 25 درصد داده‌های مشاهده‌ای استفاده و پارامترهای آماری RMSE، R2 و MAE تعیین شدند. نتایج نشان داد که برای درونیابی کیفیت آب زیرزمینی روش کوکریجینگ نسبت به کریجینگ ارجحیت دارند. مدل پرسپترون چند لایه با دقت RMSE برابر 9/369میکروموس بر سانتی‌متر، R2 برابر 932/0 و MAE برابر 78/265 میکروموس بر سانتی‌متر نسبت به دیگر مدل‌ها از دقت بیشتری برخوردار است. Groundwater quality control is of great importance in (semi-)arid zones due to the water deficit in these regions. Geostatistical models are techniques commonly developed for the interpolation and spatial prediction of groundwater quality parameters. In this study, IDW, Kriging, and CoKriging methods were used in the geostatistical, LS-SVM, and MLP models to predict the spatial distribution of groundwater EC. The models were then compared in terms of their efficiency. For the purposes of this study, data were collected from 120 wells in the Mashhad plain. Variograms were then drawn after normalizing the data for application in the geostatistical models. In the next stage, the lowest RSS value was used for selecting the one model that was suitable for fitting the experimental variogram while cross-validation and RMSE were used to select the best method for interpolation. Comparison of the three models in question was accomplished by using 25% of the observation data and the statistical parameters of RMSE, R2, and MAE were determined. Results showed that the CoKriging method outperformed its Kriging counterpart in the geostatistic model for interpolating groundwater quality. Finally, the most accurate values for the quality parameters (i.e., R2=0.932, RMSE=367.9, MAE=265.78() were obtained with the MLP model. Samani, N., Gohari-Moghadam, M., and Safavi, A.A. (2007). “A simple neural network model for the determination of aquifer parameters.” J. of Hydrology, 340, 1-11. Nayak, P., Satyaji Rao, Y.R., and Sudheer, K. P. (2006). “Groundwater level forecasting in a shallow aquifer using artificial neural network approach.” J. of Water Resources Management, 2(1)77-99. Marsily, G.D., and Ahmed, S. (1987). “Application of kriging techniques in groundwater hydrology.” J. of the Geological Society of India, 29(1), 57-79. Sreekanth, P.D., Geethanjali, N.D., Sreedevi, P.D., Shakeel, A., and Steyl, G. (2009). “Application of artificial neural networks in the field of geohydrology.” Institute of Groundwater Studies Faculty of Natural and Agricultural Sciences, University of the Free State. 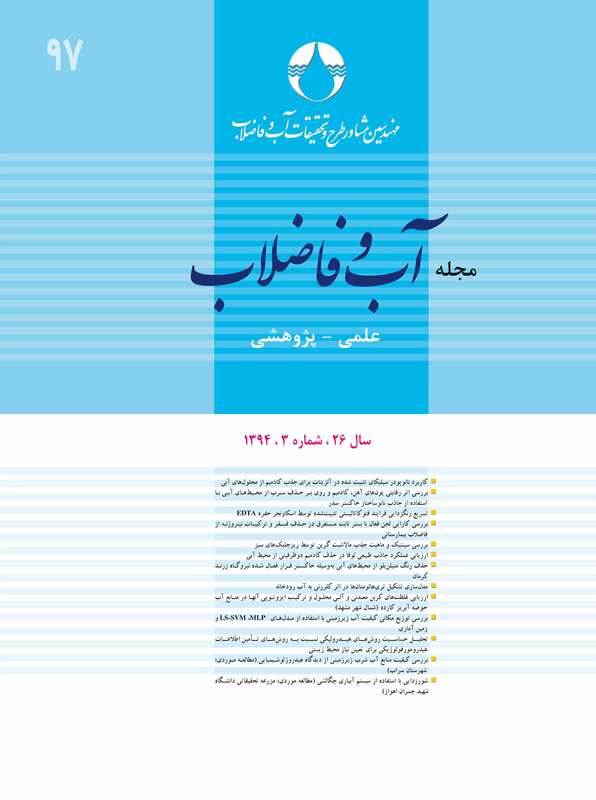 Ahmad-Zadeh, K. (2009). “Modeling daily reference evapotranspiration by using neural-fuzzy inference system.” MSc Thesis, Drainage and Irrigation, Faculty of Agriculture, Tarbiat Modarres University, Tehran. Affandi, A., and Watanabe, K. (2007). “Daily groundwater level fluctuation forecasting using soft computing technique.” J. of Nature and Science, 5(2), 1-10. 11. Mohtasham, M., Dehghani, A., Akbarpour, A., Meftah holghi, and Etebari, B. (2010). “Prediction table using Artificial Neural Network (Case Study: Plain smoking).” J. of Irrigation and Drainage, 1(4), 1-9. 12. Kisi, O. (2012). “Least squares support vector machine for modeling daily reference evapotranspiration.” Irrig. Sci., 31(4), 611-619. 13. Seifi, A., and Riahi-Madvar, H. (2012). “Input variable selection in expert systems based on hybrid gamma test-least square support vector machine ANFIS and ANN models.” Provisional chapter. Intech, doi: 10.5772/51210. 14. Asefa, T.W., Kemblowski, M., Urroz, G., Mckee, M., and Khalil, A. (2004). “Support vectors machines (SVM) for monitoring network design.” J. of Groundwater, 43(3), 413-422. 15. Asefa, T.W., Kemblowski, M., Urroz, G., Mckee, M., and Khalil, A. (2005). “Support vectors-based groundwater head observation networks design.” J. of Water Resources Research, 40(11), doi: 1029/2004 WR003304. 16. ESMI-Khani, M., Safavid, H., and Yazdanipour, M. (2010). “Integrated management of surface water and groundwater methods using support vector machine and genetic algorithms.” The Fifth National Congress on Civil Engineering, Mashhad, Iran. 17. Rezaie, E. (2013). “Design piezometric well groundwater withdrawals using support vector machine.” MSc Thesis Department of Water Resources and Water Engineering, University of Birjand, Birjand. 18. Kholghi, M., and Hosseini, S.M. (2009). “Comparison of groundwater level estimation using neuro-fuzzy and ordinary kriging.” J. of Environ. Model. Assess., 14, 729-737. 19. Sahinkaya, E., Muhsin, N., and Ozkaya, B. (2008). “Neural network prediction of nitrate in groundwater of Harran Plain, Turkey M. Irfan Yesilnacar.” J. of Environ. Geol., 56, 19-25. 20. Ahmadi, S.H., and Sedghamiz, A. (2007). “Geostatistical analysis of spatial and temporal variations of groundwater level.” J. of Environ. Monit. Assess., 129, 277-294. 21. Taghizadeh, M., Zareian Jahromi, M., Mahmodi, Sh., and Heidari, A. (2008). “Spatial distribution of groundwater quality with geostatistics (Case study: Yazd-Ardakan plain).” World Applied Sciences Journal, 4(1), 9-17. 24. Vapnic, V.N. (1998). Statistical learning theory, Wiley, New York. 25. Cristianini, N., and Shawe-Taylor, J. (2000). An introduction to support vector machines, Cambridge University Press, UK. 26. Vandewalle, J., and Suykens, J.A.K. (1999). “Least squares support vector machine classiers.” J. of Neural Processing Letters, 9(3), 293-300. 27. Mellit, A., Massi Pavan, A., and Benghanem, M. (2013). “Least squares support vector machine for short-term prediction of meteorological time series.” J. of Theor. Appl. Climatol., 111, 297-307. 28. Saifi, A. (2010). “Development of an expert system to predict daily reference evapotranspiration by using Support Vector Machine (SVM) and compare its results with ANFIS, ANN and experimental methods.” MSc Thesis Irrigation and Drainage Engineering, Faculty of Agriculture, Tarbiat Modarres University, Tehran. J. of Earth System Science, 116(1), 49-55. 31. Coulibaly, P. Anctil, F., and Bobee, B. (1999) “Provision hydrologique par reseaux de neurons artificials.” Can. J. Civil Eng., 26(3), 293-304. 32. Dagostino, V., Greene, E.A., Passarella, G., and Vurro, M. (1998). “Spatial and temporal study of nitrate concentration in groundwater by means of co regionalization.” J. of Environmental Geology, 36, 285-295.